The official version of why Ukrainian troops suffered significant losses near Ilovaysk in August 2014 has not changed four years after the Ilovaysk Cauldron tragedy – the Ukrainian military leadership says it is Russia's regular troops who must be held responsible. The only reason for massive losses among Ukrainian troops was an unexpected attack by the Russian armed forces, Serhiy Sobolev of the Main Operations Directorate of the General Staff of the Armed Forces of Ukraine told a news conference in Kyiv on occasion of the fourth anniversary the tragedy, according to UNIAN. The official noted that as of 20 August 2014, Ukrainian troops were preparing to surround pro-Russian militants and mercenaries in order to terminate them in the area. "Luhansk was blocked from the north, west, south and partly from the east; the railway and motorway junction in Debaltseve was taken under control, personnel, weapons, military equipment and material resources supply routes to Donetsk, Makiyivka, Horlivka and Yenakiyeve were blocked. Thus, Russian militants were separated into four parts, which created prerequisites for further completion of their blocking and destruction," Sobolev said. At the same time, he added that Russia, assessing the threat of the destruction of its hybrid forces, on 24-25 August from various directions dispatched to Ukraine up to eight tactical combat groups, which dramatically changed the balance of forces in favour of the enemy. In particular, by engaging Ukraine troops with multiple rocket launchers and artillery from the Russian territory, the enemy forced them to abandon positions and withdraw to the Kuteynykove-Osynove-Komsomolske line. 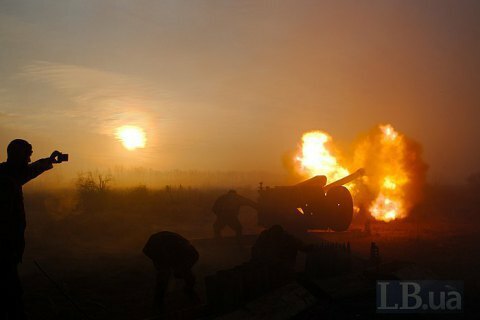 In addition, on 25-26 August, battalions of the Interior Ministry during the clearing mission in Ilovaysk were defeated in a clash with the enemy and then blocked in the area. According to Sobolev, the Antiterrorist Operation HQ decided to reinforce the mentioned units with the battalion tactical group of the 72nd detached mechanized brigade, company tactical groups of the 92nd and 93rd detached mechanized brigades, as well as the combined unit of the 42nd territorial defence battalion, and developed a plan how to unblock Ilovaysk. The operation was scheduled to start on 1 September. However, units of the 72nd and 93rd detached mechanized brigades failed to deploy in designated areas, while units of the 39th battalion, which had been at checkpoints near Ilovaysk, arbitrarily abandoned their positions. At the same time, commanders of the battalions of the Interior Ministry in an ultimatum demanded an immediate exit from Ilovaysk under the guarantees of the Russian military. "This made it impossible to carry out an operation to release Debaltseve and allowed the enemy to seize the initiative," Sobolev stressed. He added that, despite this fact, a decision was made to withdraw Ukrainian units from Ilovaysk on 28 August, while the issue of an unhindered withdrawal was agreed with the Russian military leadership. In the so-called "withdrawal corridors", units of the Interior Ministry and the Armed Forces were attacked by Russian regular troops, which resulted in the death of 150 personnel and wounding of another 90. In general, during the entire period of the Ilovaysk battles, from 7 August to 30 September, some 366 Ukrainian soldiers were killed, 429 wounded, 128 captured, while 158 went missing. To date, 11 servicemen are still being held captive, while 84 are considered missing in action. As UNIAN reported, at the end of August 2014, after fierce fighting, ATO forces were surrounded near Ilovaysk of Donetsk region. Russian military shelled the withdrawal corridor. The Parliamentary Interim Investigation Commission for Investigation of the Ilovaysk Tragedy estimated the total losses of Ukrainian troops at nearly a 1,000. On August 14, 2017, the Prosecutor General's Office announced the results of the investigation, naming the main culprit the military command of the Russian Federation. The Prosecutor General's Office reported that the materials of the investigation into war crimes during the events near Ilovaysk were forwarded to the office of the International Criminal Court in The Hague. The PGO stated that on the night of August 24, 2014 during the Ilovaysk tragedy, the invasion groups of the Russian Armed Forces consisted of nine battalion-tactical groups, involving 3,500 personnel, up to 60 tanks; up to 320 BMD (IFVs); up to 60 artillery units; up to 45 mortars; and 5 ATGMs. Veterans of the Battle of Ilovaysk demand that military commanders be held accountable for planning the Ilovaysk operation and all other steps that led to the tragedy.